Introducing the latest products in the QED Pro Range – the short length HDMI cables. QX16/4 PVC are high performance and exceptional quality installation speaker cables with a flame retardant PVC outer sheath. They are designed to deliver excellent levels of performance vs cost in all multi-room and home cinema installations where low smoke zero halogen (LSZH) cables are not specified. QX16/2 PVC is a high performance and exceptional quality installation speaker cable with a flame retardant PVC outer sheath. Designed to deliver excellent levels of performance vs cost in all multi-room and home cinema installations where low smoke zero halogen (LSZH) cables are not specified. HNCPROPLUS+™ for Cat6 is the industry's first HDBaseT™ category cables. HNCPROPLUS+ cables provide superior HDBaseT performance for your HDBaseT devices. High End Landscape Series Speaker Systems, Direct Burial Applications without Conduit, High End Professional Audio Outdoor Rated, Home Theater Grade, Speaker Audio. SCP 14 AWG 2-core speaker cable, 105 strand OFC, LSZH, Easy Strip HD PVC jacket, orange, 152.5m reel. Get all the features of QXCAT6 UTP with the addition of an Aluminium Mylar screen for excellent noise rejection. 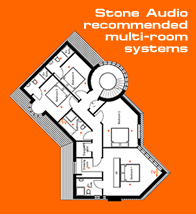 ◾Suitable for use with all major multi-room control systems and recommended for use with all Systemline products. ◾Performance up to 250MHz and suitable for HDBaseT™ applications.